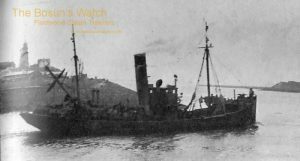 7.11.1911: Launched by Smith’s Dock Co. Ltd., South Bank, Middlesbrough (Yd.No.486) for Port of Blyth Steam Fishing & Ice Co. Ltd, Blyth. (J.E. Rushworth, manager) as LORD WIMBORNE. 12.1911: Completed. as LORD WOLMER. 13.12.1911: Registered at Blyth (BH74) (O.N.133222). 20.8.1913: Sold to Consolidated Steam Fishing & Ice Co Ltd, Grimsby (John D. Marsden, manager). 28.8.1913: Registered at Grimsby (GY917). 3.1915: Requisitioned for war service as a minesweeper (1-3pdr)(Ad.No.1235). Based Taranto. 4.3.1924: John D. Marsden created a baronet. 6.1926: Sold to N.V. Vereenigde Explotatie Mij., IJmuiden (A. J. Veltkamp & S. Koster, managers). 1931: J. F. Clercq & S. Koster appointed manager. 6.1926: Registered at IJmuiden as CLASINA LUTHER (IJM59). 1933: Sold to N.V. Visscherij-onderneming “De Vem” (F. Thiel, manager). 1939: Sold to N.V.Vereenigde Steenkolen Handels Mij XVII (Company was a part of “ De Vem”). 1940s: Escaped to England and fishing from Fleetwood (Bloomfield’s Ltd, managing agents). 5.1951: Sold for breaking up in Holland. IJmuiden registry closed. 11/03/2013: Page published. 6 updates since then. 13/01/2019: Removed FMHT watermark from image. This entry was posted in Steam Trawlers, Steamers (Picture), Wartime Visitors and tagged No Fleetwood owners, Wartime Visitor on March 11, 2013 by Fred Smith.